The 25.6 metre motor yacht Perfect Lady, listed for sale by John Jacobi at Merle Wood & Associates, has been sold. Perfect Lady was built in GRP by US yard Hatteras with delivery in 1998 as a flybridge motor yacht and last refitted in 2012. Accommodation is for six guests in three cabins consisting of a master suite, a double to starboard and a portside twin, all with en suite shower facilities. In 2012, the owners put in substantial efforts to upgrade her decor, entertainment system and amenities. A major improvement was the removal of the flybridge davit and the addition of transom swim platform to carry the tender. This decision also opened up the aft section of the flybridge for a built in Jacuzzi tub and granite bar, turning the entire flybridge into a tropical playground. Perfect Lady has a light and contemporary interior decor in cream, crisp white and sea blue accents. The saloon is generous and boasts two opposing sofas, two coffee tables, occasional chairs and spectacular panoramic windows. Above, the forward section of the sundeck is shaded and features a marble topped wet bar with stools and surrounding seating. Twin 1,350hp Caterpillar engines give her a cruising speed of 15 knots. 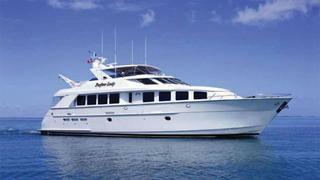 A popular charter yacht, Perfect Lady was asking $1,595,000.